The normal route to climb Mount Ama Dablam is from its South- West Ridge. Most of the mountaineering beginners start their climbing through this Mount. Ama Dablam 6812meters, Ama Dablam is a small snow-capped peak of 6812m lying in the Everest region. This South - West ridge is the normal and most popular route to ascend the Mt. Ama Dablam This Mountain is considered to be the most technical & difficult to climb. The Mountaineers have to cross-difficult ice rocks and steep snow climbing one their climbing route. Mountaineers usually have to pitch 3 high camps on the mountain of mount Ama Dablam 6812m. Ama Dablam ExpeditionThe climbing route from Camp II is mostly with the steep mixed alleyways of rock, ice, and snow. The route leads to the slope climb to snow ground and then passes through steep snow and ice tunnel then finally along the snow ridge go camping III, From here to the summit, it is steep climb on snow and ice to the right of a huge hanging glacier. From the Top of mount Ama Dablam very charming sceneries of Mount Everest 8848m, Lhotse 8516m, Island peak, Makalu 8463m, Khumbu Himalayan and rest of the snowcapped surrounded mountains can be envisioned. Day 04: Phakding to Namche Bazaar (3,440m.) 5-6 hours. Day 05: Namche Bazaar (3,440 m/11,283 ft) acclimatization. Day 06: Namche Bazer to Tengboche Monastery (3860 m)- 5 hrs. Day 07: Tengboche to Pangboche (3930m.) 3-4 hours. Day 08: Pangboche to Ama Dablam Base Camp (4570m. ): 4-5 hours. Day 09: Acclimatization and Pre-climb training at Ama Dablam Base Camp. Day 10: 10 to 20 - Climbing period of Ama Dablam. Day 21: Trek back to Namche Bazaar (3441 m)- 6 hrs. Day 22: Namche bazer to Lukla ()2804m)- 6 hrs. Boiled and purify drinking water at base camp. Allow $50-100 for general non-sherpa crew who stay at base camp. 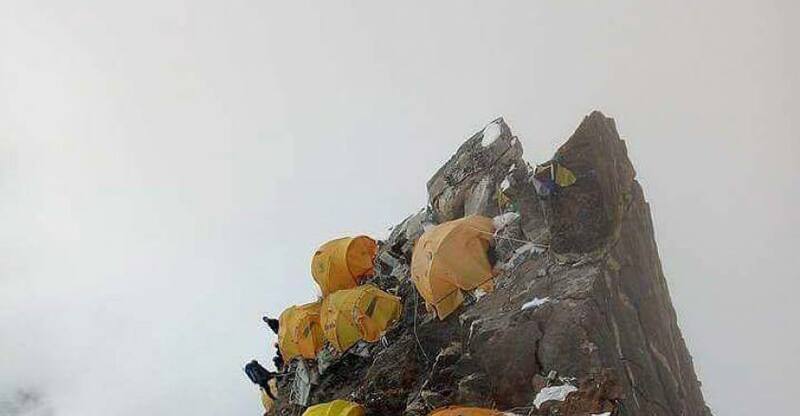 Allow $100-200 for sherpas who go up to the base camp. After breakfast in our hotel, we may wander around nearby areas and do some shopping for our adventurous trip the following day. In the afternoon Formal briefing at the Ministry of Tourism. We pre-trip discussion and meet our trekking guide as well as other participants. You will also be briefed on the nature of the expedition, equipment, and team composition. Later, we will go back to our hotel and. overnight in hotel. 40 min flight, 3-4 hours trek. After breakfast, we drive to the airport for our flight to Lukla. After flying above the breathtaking lush hills and snow-capped mountains, we reach Tenzing-Hillary Airport at Lukla. This is one of the most beautiful air routes in the world culminating in a landing on a hillside surrounded by high mountains. At Lukla, we meet the rest of our staff members and begin our trek to Phakding. To assist in acclimatization, we only have a short hike today. Overnight in tea house. We begin trekking after breakfast. Our trail passes through pine forests and we also walk alongside the Dudh Koshi River. We continue our trek through lush pine, fir and juniper forests, cross a few suspension bridges and reach Namche Bazaar. The small town is the main trading center of the Everest region. Overnight in tea house. The trek continues along the rushing glacial waters of the Dudh Kosi, with magnificent views of the mountains. We trek to an altitude of 3860 meters today. After five hours we’ll reach Tengboche, where the local monastery can be seen. Inside the monastery are incredibly ornate wall hangings, a twenty-foot sculpture of Buddha, and the musical instruments and robes of the Lamas. The group will be taken to observe a prayer ceremony in either the evening or morning, depending on how the day’s trekking progressed. Overnight in tea house. The trail drops to Debuche crosses suspension bridge on the Imja Khola and climbs to Pangboche among thousands of mani stones. Pangboche is a scenic village surrounded by Everest to its north, Ama Dablam, Thamserku. Overnight in tea house. We begin today crossing the Dudh Koshi River. Next, we ascend on a trail which will take us to the Ama Dablam Base Camp. The Base Camp is large and open grassland at the foot of Mt. Ama Dablam. Overnight in Tent camp. Our guides will provide training on peak climbing techniques and the best ways of using climbing gear such as the ice axe, climbing boots, crampons, harness, ascender etc. The training will also include using ropes for climbing both up and down. The training will boost our confidence and climbing skills, thus increasing our chance of a successful summit of the mountain. Overnight in Tent camp. We do not provide a day-to-day itinerary for the climbing period, as this will be determined by the expedition leader and members. Guides will take a flexible approach based on what fits with climbers’ and their own experience. Typically, the team will spend a few days at the base camp organizing food, practicing rope skills, and acclimatizing before moving above the base camp. It is normal to ‘tag,’ or spend at least one night in Camp 1 (5700m), as part of any acclimatization schedule before returning to the base camp, resting, and preparing for a summit push. Ama Dablam climbs via southwest ridge After leaving the base camp old grassy moraine ridges are followed roughly eastwards to a broad saddle 5150m from where we can see the Mingbo La. From the saddle, we ascend easily northwards until the ground steepens at the start of a large boulder field. We may place an advanced base camp at 5400m below the boulder field. The route continues north around the base of the boulder field, and then follows cairns upward to the toe of the southwest ridge. At the end of the boulder field, slabs are crossed and then a short gully ascended, allowing access to the ridge proper in a very exposed position. Easy scrambling on the east side of the ridge leads quickly to Camp 1. There are four or five tent platforms. From Camp 1 we contour around the snowy bowl (possible alternative site for Camp 1) until we are below two rock fingers. The east side of the ridge is followed, climbing easy mixed ground until a short pitch of “severe” standard leads to the ridge proper. The ridge is narrow in places, with difficult turns on the east side, until the second tension traverse leads to two pitches of “very severe” standard. The route continues on the crest of the ridge for a short distance until we are forced via an awkward step onto the west side of the ridge. The crest of the ridge is regained and easily navigable roads followed to the start of a traverse on the east face, which leads to the Yellow Tower. This 15-meter pitch, just below Camp 2, is one of the hardest pitches on the climb at VHS (5.8) standard. A short section of ridge now leads to Camp 2 (5900m). Camp 2 has very limited tent space (three or four tent platforms) and is extremely exposed. It is sometimes only used to store equipment dump, with expeditions choosing to go from Camp 1 to Camp 3 in a single push. From Camp 2, the climb skirts a red rock bluff on the east and, after a step-down, follows the snow ridge directly to a tricky traverse east. This leads to a gully between the Grey Tower and the lower rock buttress. We climb the gully until a very exposed traverse line is reached on the west side of the ridge. A short snow slope is ascended, allowing us to reach the start of the Mushroom Ridge. Following this typically involves negotiating some steep snow sections, until Camp 3 (6300m) is reached. The route climbs the snow and ice slope directly above Camp 3 and to the right-hand side of Dablam. We continue to skirt Dablam on the right, then moving west to gain a small snowfield below the Bergschrund. The Bergschrund is crossed and then the climb heads directly to the ice crest above. This is followed by a magnificent climb to the summit. The climb from Camp 3 to the summit is relatively less technical. After summiting the peak, we return back to the base camp. Overnight at Tent camp. We descend to Namche Bazaar (3441m). Overnight in tea house. We return to Lukla (3404m) we’ll take time to reflect on the trek as a group, and the personal achievements of all who took part. Evening all together farewell party. Overnight in the teahouse. On the scenic thirty minute flight back to Kathmandu, Overnight in hotel.